Halloween isn't just about candy and costumes. 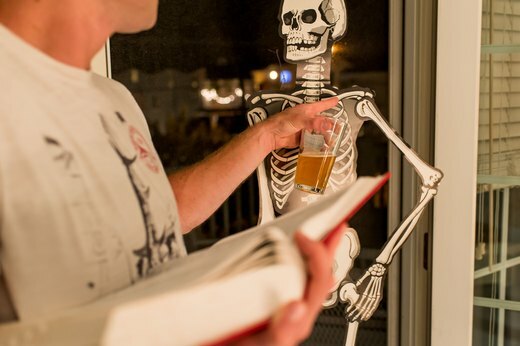 For adults, the spooky holiday is a great opportunity to let loose and get a little crazy. If you're all dressed up and ready to celebrate, you don't want the party to be a dud. 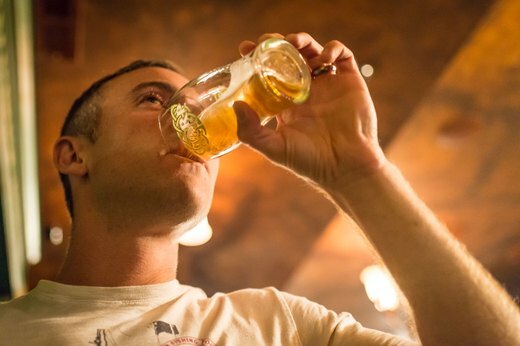 Try out some drinking games to spice up the celebration. 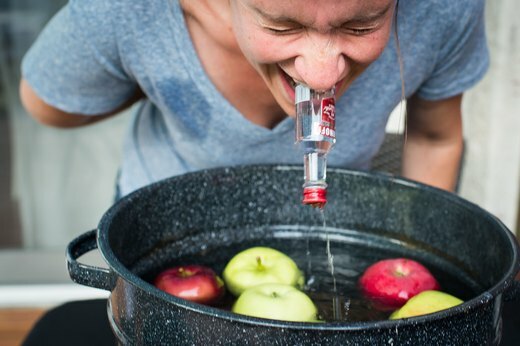 Purchase some single-serving size bottles of liquor and place them into a bucket filled with water, just like if you were bobbing for apples. When someone pulls the small bottle out of the water with their teeth, they have to drink it. If you want to stick with apples, carve a number into the side of the fruits before putting them into the water. When someone pulls out the apple, they have to take that number of shots or sips of their drink. 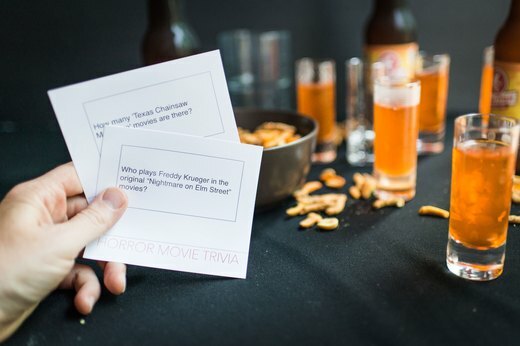 Pick out your favorite scary movie and make up a few simple drinking rules. For example, you could take a shot every time someone gets killed, or chug a drink every time scary music plays. Regulate your rules so that the trigger is as frequent or infrequent as you like. Counting is easy, unless you're counting and drinking. Players have to count off out loud as they go around, except that they must say "monster" on numbers divisible by three, and "mash" on numbers divisible by five. For example, "one...two...monster...four...mash...monster...seven..." Those who mess up the counting have to take a drink. Research horror movie trivia online, and write up some questions on a card or set of cards. Each incorrect answer results in a penalty. That penalty, of course, is a drink. This game works best if everyone is drinking different kinds of drinks, because then the penalty for having to drink from the pumpkin is that much worse. Use a plastic pumpkin that doesn't leak. Spread a deck of cards face down around the pumpkin. Assign different games to different cards. For example, each person who draws a "jack" has to make a dare. Each person who draws a "king" can make anyone drink. 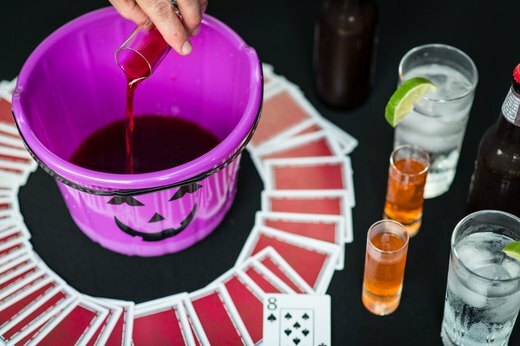 Get creative with the rules you set; just remember to set the fours and eights as cards that require the person who draws them to pour a shot-sized portion of their drink into the pumpkin. Anyone who draws the "ace" has to drink whatever is in the pumpkin. Purchase a small plastic skeleton. Have your guests try and guess the names of the bones. You'll need to have reference materials handy, like an encyclopedia or an online source to verify the answers. Each incorrect answer results in a one-shot penalty.